This movie fell right in line with what my son enjoys watching! We had a wonderful movie night checking out this old story turned modern movie! I watched this on movie night with my 13 year-old son. It was a new modern and clever take on the King Arthur legend. We both enjoyed the young version of Merlin and his crazy antics during the film. I also liked how Merlin introduced “The Chivalric Code”. Merlin gives our young heroes a passionate speech about the importance of upholding the Chivalric Code during their quest to save the world, and as the kids begin to take it seriously they realize its value. Priceless! The new adventure takes place in London with a bunch of middle school children. As with any kids movie, lessons are learned along the way. One of my favorite parts is when the bullies actually start working with the good kids to fight evil. My son liked the fact that the costumes of armor the school children wear aren’t over top, but more realistic to what kids would be able to produce. Now the downside: We both thought it went on a bit too long. I thought it was over and then it just kept going on! Overall though, a fun movie for both boys and girls. 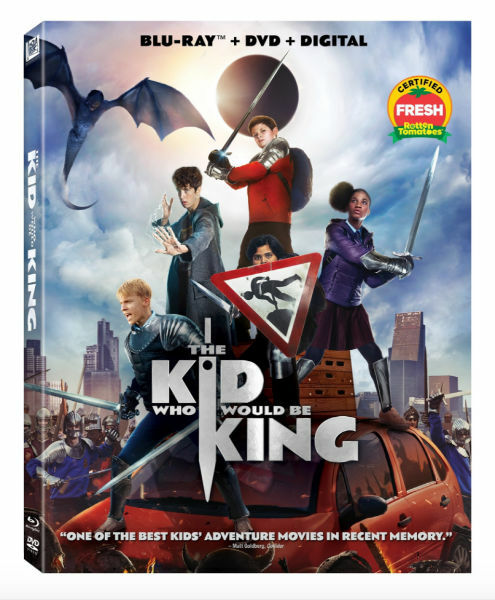 If you are looking for something to watch over this Spring Break with the kids The Kid Who Would Be King is a good choice! One of the coolest things in the film is when Merlin performs the intricate hand gestures required to summon his magical powers, and there are some really cool tutorial videos in the bonus content that show viewers how to pull off the spells. What do you love to do on movie night? I haven’t seen this but it looks like a good movie.